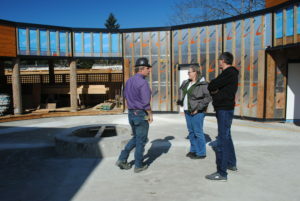 Final construction at the Nanaimo Aboriginal Centre Passive House complex is underway. The long narrow plot holds 3 buildings that together will house 25 affordable suites for youth, elders, and families along with a common Amenity Room for activities such as after-school programs and extended family gatherings. Through community consultation, the buildings were designed to be 2 stories high, respecting the neighbours’ wishes that the buildings not block the southern sun. The slope of the roofs (the azimuth, as Dallas called it) will allow for all suites to receive full sun even in the middle of December and be shaded by sun screens in the summer heat. The central circular courtyard will be the community heart where residents can gather around the firepit and enjoy cultural entertainment on the raised, covered stage that will be backed by a ‘living wall’ of lattice and climbing plants. The townhouse style with entrances facing the courtyard will encourage more neighbourly interactions than a typical apartment style building. The design also took into consideration historical architecture of the region, referencing Northwest Coastal Indigenous longhouse buildings. The courtyard area with stage and firepit showing 3 stages of wall construction. Standing in the courtyard, there was the distinct smell of cedar. Cedar was chosen as a building material for its cultural significance and longevity. Salvaged utility poles were used as architectural features and the fence along the back and park side was built from reclaimed planks from the Expo ‘86 Saskatchewan House. As we were speaking, Dallas was drowned out by the noise of a passing motorcycle. We moved inside an Elder suite and we could no longer hear Bowen Road. At peak times more than 34,000 vehicles per day can pass by, but the residents will not hear more than 25 decibels of street noise – about as much sound as a whisper or a very quiet library. This is one of the benefits of having a super insulated Passive House building. An airtight structure with quality windows and high performing insulation will also minimize heat transfer reducing the energy input needed to maintain a comfortable indoor environment. Low energy consumption for both heating and cooling purposes will result in near zero-energy buildings, which will benefit the residents by considerably lowering their utility bill. The durability of the materials used will also save money by decreasing maintenance costs and give long-term comfort. Entrances details are being installed external to the building envelope. Dallas explains the overall strategy and construction specifics. Dallas opened one of the triple glazed windows. Being thermally insulated in both pane and frame, the windows are specified to have an interior surface within degrees of the room temperature to avoid interior condensation and induced drafts. The heat recovery ventilation system (HRV) will also help keep the house comfortable by circulating fresh air filtered of dust and allergens. 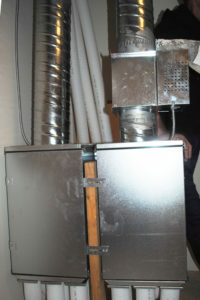 Air leaving the house will be drained of its heat, which is recycled to warm the incoming air. The air temperature will be evenly distributed with no more than 1oC difference in air temperature in a vertical meter. We were told the HRV will run on the amount of energy of a toaster. There is also a preheater that will only kick on at temperatures below -5oC to pre-heat the air entering the home, but the preheater is only expected to run about 3 days a year. 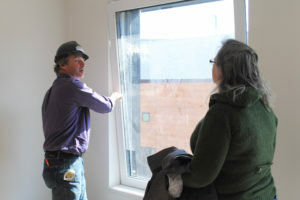 The triple glazed windows open easily, but residents won’t have to rely on opening and closing windows to get fresh air as the ventilation system will do that work. Continuous slab insulation is extruded polystyrene (R40). No foundation is in contact with the ground. Concrete is then air sealed with 10mm poly. Roofs are minimum 10” thick with poly insulation (R45). All framing was reduced from 2×6 to 2×4. 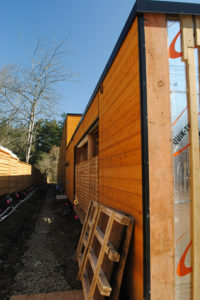 Windows were moved towards the exterior of the building by adding 4” using 2×8 window and door bucks (any condensation on the exterior will drain outside the envelope). Air, vapour and moisture membranes are a single a layer of Blueskin on the exterior. All framing and sheathing portions of the building are inside the conditioned airspace, adding longevity to the building. These features and more (insulated pipes, LED lights, etc.) will decrease energy consumption substantially not only just on-site but from the point of origin (the hydroelectric dam), accounting for energy lost in transmission too. The heat recovery ventilation system (HRV) for the residences brings in fresh air, while conserving heating and cooling energy. As we toured the exterior of the buildings, we talked about the wetter than average spring last year and the challenges of site drainage (solutions included contouring and French drains) – “we live in a rainforest after all.” We also touched on the archeological and environmental setbacks, the Aboriginal art that will grace the exterior, the patios facing the road that will be fenced for children’s safety, and of course, the building envelope. The patios, structures around the doors, and the sun screens – features that extend from the building – are all attached to the exterior of the building rather than through it to avoid thermal bridging. Thermal bridges are areas in a building that allow a heat transfer between the exterior and interior through materials that are conductive, like metal beams that extend though the building to support a balcony or materials at junctions between walls and floors. Care has been taken to design and construct buildings that are thermally secure. Site contouring and drainage (above), moisture barriers, and condensation – considerations for design and construction in a wet environment that will be crucial to long term durability and comfort. The buildings will be insulated and airtight. Air tightness will reduce the energy consumption due to air leakage and avoid moisture condensation problems and uncomfortable drafts. These builders are not just full of hot air either, pun intended. 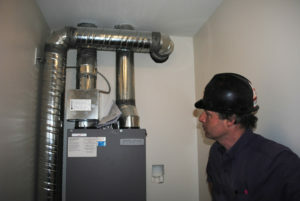 Tests are conducted to verify the building performance. Tools used can include infrared heat cameras, probing thermometers, watt meters for energy efficiency, smoke/fog to visualize air leaks, and the blower door test. The blower door test pressurizes and depressurizes a building to exaggerate air leaks, making the leaks easier to measure and locate. 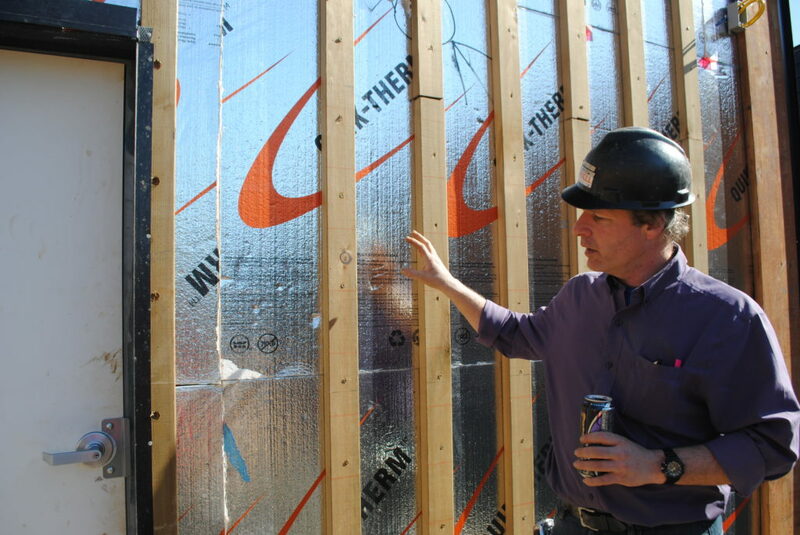 The Canadian R-2000 program has an airtightness standard of 1.5 ach50 (air changes per hour at 50 Pascals pressure). 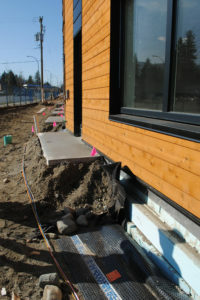 The BC Energy Step Code requires airtightness of 3.0 ach50 (Step 2) to 1.0 ach50 (Step 5). 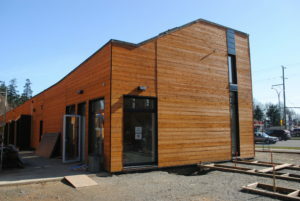 Passive House buildings must achieve a stringent airtightness requirement of 0.6 ach50. 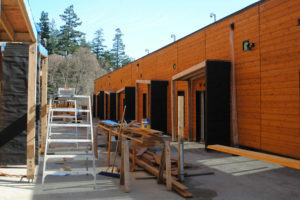 In a mid-construction blower door test, the Nanaimo Aboriginal Centre Passive House buildings reached 0.106 ach50. 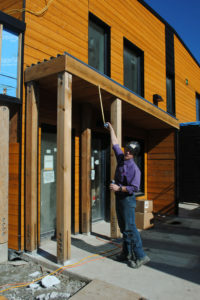 They will run a final blower door test, which they will submit as part of Passive House certification from the international Passive House Institute based in Germany. At the end of the tour we entered the Amenity Room where the recycled utility poles and spruce beams bring the timber architectural features inside. We checked out the mezzanine where we saw the HRV and talked about how the usage of this room will require different thermal calculations. The Amenity Room has a larger air volume with inconsistent occupancy. For this reason, baseboard heaters were added to make up the difference in body heat when the room is not in use. The room was still the construction site office with safety gear on the table, extra wood planks piled in neat stacks, and a scaffold reaching to the vaulted ceiling. However, it was easy to imagine the space with long tables set-up for a shared meal or with kids crafting on a Saturday, or chairs in a circle for an indoor gathering or celebration. 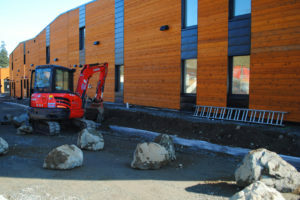 These buildings were designed with community building in mind – multigenerational learning and cultural exchange – to support the goals of the Nanaimo Aboriginal Centre. 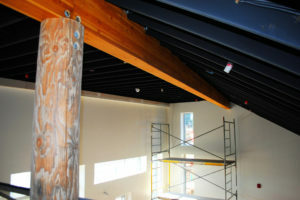 Wooden architectural features of the Amenity Room. Energy efficiency in high performance buildings leads to resident comfort, lower operating and maintenance costs, and positive environmental impact. 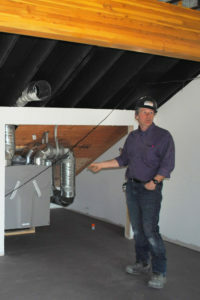 I am happy to have seen the buildings before they are completed to learn more about Passive House construction. I will continue learning more about high-performance buildings at the upcoming Passive House Design and Construction course in Victoria. Many thanks to Dallas for sharing his knowledge and his enthusiasm on our tour, Saywell Construction Management for agreeing that some of Dallas’ time be occupied with outreach, and the Nanaimo Aboriginal Centre for welcoming us to this project. 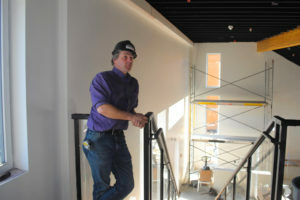 The construction is nearing the final stages with occupancy as soon as April 15th.